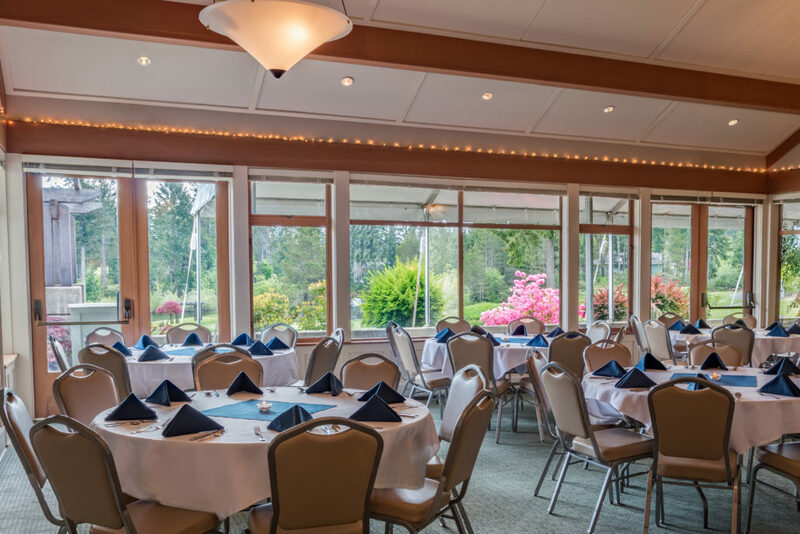 Located just minutes from Bremerton, Silverdale, and Gig Harbor, McCormick Woods Golf Club is an exceptional facility for meetings, anniversaries, team bonding, baby showers, celebrations of life, and all your event needs. Enjoy your next meeting or special event with our captivating scenery and an expert staff of event planners to make your day a success. Our goal is to ensure that your event goes above and beyond all expectations with our delicious banquet menus for you to choose from and our stunning space that can accommodate up to 250 guests. The meeting rooms at McCormick Woods are expandable, highly configurable, and include computer access, projector screens, and podiums. For more information please contact Stephanie Michael, Sales and Events Manager, at smichael@clubhousemw.com or 360.329.5248. Trellis Rooms (East and West) This space offers breathtaking views of the lush golf course and provides a distinct private entrance, a foyer, and private restrooms. These rooms may be expanded to one large space or separated for smaller gatherings. Both provide access to the beautiful covered patio and are perfect for receptions and other special events. North Lake Room This open-air structure creates an idyllic space for outdoor events. 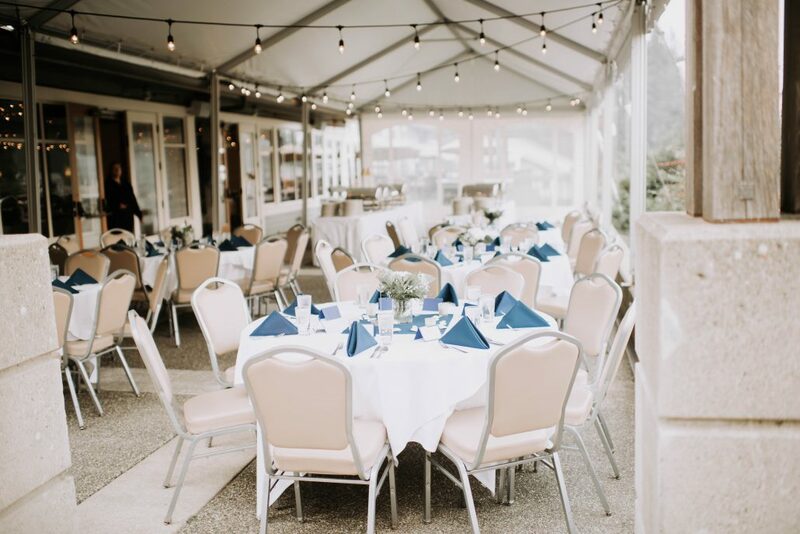 The North Lake Room gives guests the outdoor experience while offering ample coverage from the unpredictable Northwest weather. Gallery Rooms (East and West) Located on the lower level, these charming rooms may be opened up for a mid-sized event or separated for a smaller setting perfect for luncheons or bridal showers. Conference Room One of the larger spaces located on the lower level, this room is well-suited for proms, team building exercises, comedy shows, and other unique events. Our entire team would like to pass on our sincere appreciation for [Stephanie’s] incredible help in putting together our Leadership Team Retreat on August 9. From the planning process, (including answering a million questions from me) to the day itself, [Stephanie’s] assistance was essential to the success of the day. [Stephanie] and the team were ready, willing, and able to make sure we had everything we needed. And, the lunch was just right and we really enjoyed eating outside! [Stephanie] was on top of things from the beginning to the end and we look forward to planning any future events with McCormick Woods! Since 1994, McCormick Woods Golf Club and The Clubhouse at McCormick Woods has been the home of The Detlef Schrempf Celebrity Golf Classic. Each year, McCormick Woods allows us to take over their beautiful, award winning course with 180 golfers for our annual charitable event. Add the staff and volunteers and that equals about 235 for lunch and dinner. With an acclaimed chef and a friendly, professional staff, both on the course and in the Clubhouse, McCormick Woods offers a tournament experience like no other. We highly recommend McCormick Woods Golf Club and their Clubhouse to anyone as a premier venue for tournaments and special events of any kind. The venue was so amazing and everything turned out perfect. We couldn’t have been more happy!! Thank you so much for everything! We moved our CNR Inc. annual golf tournament to McCormick Woods over 17 years ago and wish we would have done it sooner. The staff at McCormick Woods makes running our golf tournament so simple. Even with our complicated scoring and side games, the staff takes our rules and does it all. The natural setting of the golf course is gorgeous and the food is always spectacular from boxed lunches to the awards dinner. Every aspect of the tournament is handled professionally and we highly recommend McCormick Woods as a tournament venue to anyone hosting a golfing event. Coy Anglin Vice President CNR Inc.
Our family and friends were lucky enough to experience and enjoy the wedding and reception of one of our son’s and daughter-in-law at McCormick Woods Golf Club and The Clubhouse. The actual wedding took place outside under the gazebo and the reception was inside. The attendance was very large, close to 400 people, and the accommodations & food stations were fabulous. The entire event exceeded our expectations and we would highly recommend McCormick Woods for any occasion. Our company CNR Inc, has held many training sessions and retreats for our company at The Clubhouse at McCormick Woods. Their facilities are excellent for business meetings of all types. They provide everything from podiums to electrical to wireless computer access. As an added bonus, their chef is award winning and the service is always exceptional. We highly recommend The Clubhouse at McCormick Woods for any type of business meeting need. Thank you [Stephanie] for helping to make the 60 year class reunion for South Kitsap High School a success. Everyone enjoyed the events and the deli buffet was a big hit. Thank you to your team for also contributing to the success of the event. I would like to say ‘thank you’ for everything you all did to make our daughter’s wedding day so special. We have attended many weddings at your venue and knew that we were in great hands before the wedding, but it was even more special for the entire day of the wedding. All the employees were invisible to our guests, but whenever ANYONE wanted or needed something they were right there to attend to our guests. It was like a magical experience for all of us! Our guests just loved everything about the venue and service! But the FOOD and CAKE put everything over the top! The food was fantastic! The mashed potatoes topped with chicken marsala was to die for. The fish was so tasty that it just flaked apart and melted in your mouth and then there was the beautiful cake! Best tasting 3 layer cake ever! Our guests said it was the best wedding they have been to in many years! From the first day working with you, Stephanie to the end of the wedding was so easy. My husband and I thought everything went better than we could have imagined. So thank you all for everything!